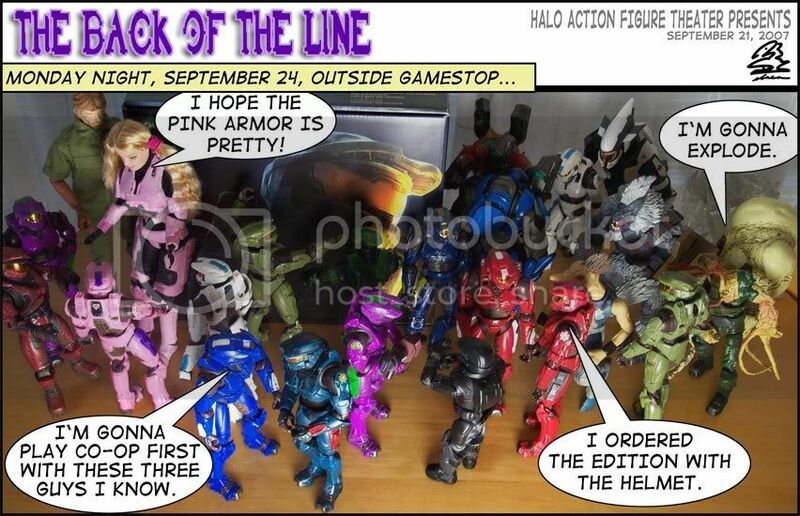 TTL Gamer Gal Hawty McBloggy has been having these pre-launch Halo Activities over the last week and today’s was “Do a single panel comic using Halo Action Figures”. So, I mean, that was like cheese to a rat, that rat being me. I WANTED to resist, but I couldn’t. Who said you can’t have fun with those carrier forms? They are a laugh-a-minute! Also, I thought of a second fourth dastardly thing that the men in black could be doing to torture poor Colonel Barbarella O’Hara. Namely WoW ganking. On World of Warcraft, “ganking” refers to a high level player going to a low level area of the opposite faction and just killing all the newbie players, who stand absolutely no chance. And then killing them over and over until finally some high level allies show up and get rid of the ganker. If you are a newbie this is tremendously frustrating. 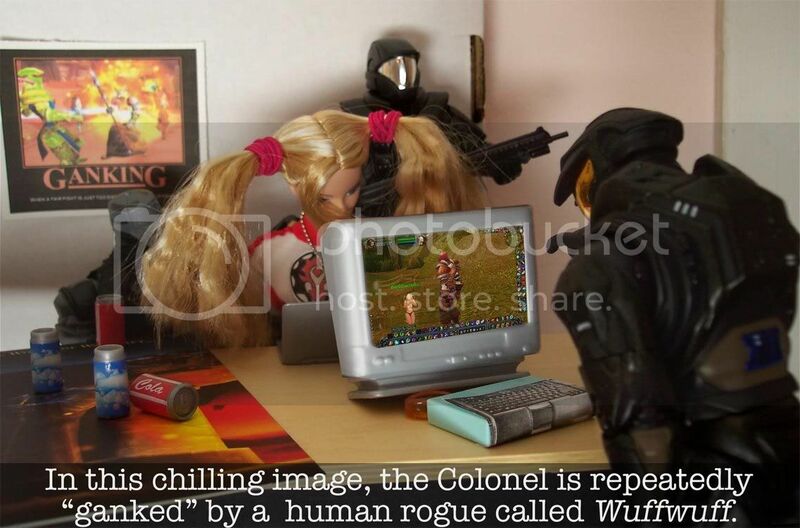 Spyton had told me of an episode where he was mercilessly ganked by a level 70 rogue with the name “Wuffwuff” until he finally just quit playing. I thought that seemed like torture. Please note Col. O’Hara’s awesome Horde shiRt. And that the Man in Black plays Alliance. ‘Nuff said. This entry was posted on Friday, September 21st, 2007 at 10:37 am and is filed under News. You can follow any responses to this entry through the RSS 2.0 feed. Both comments and pings are currently closed.